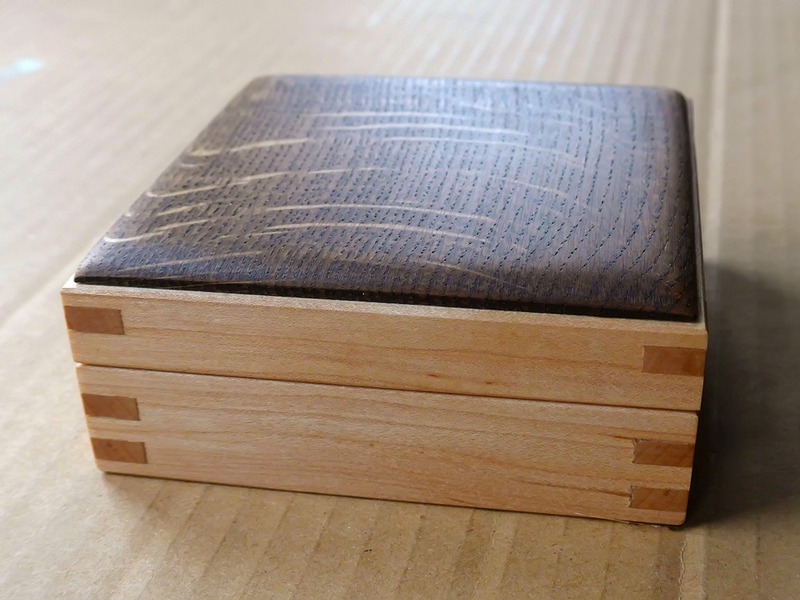 so I decided to make a box for them. 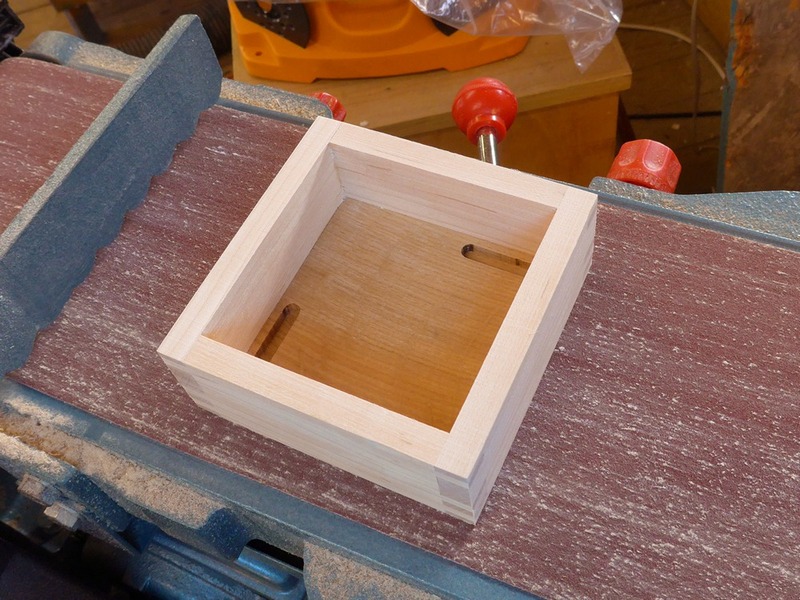 They fit together, one on top of the other, so I decided on a square-shaped box. 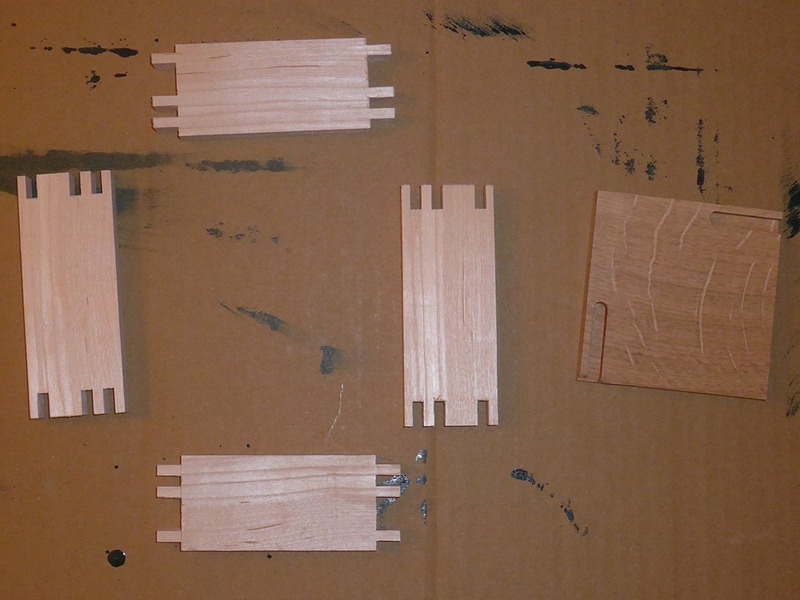 They formed a square of exactly 80mm so I based all my measurements on that. 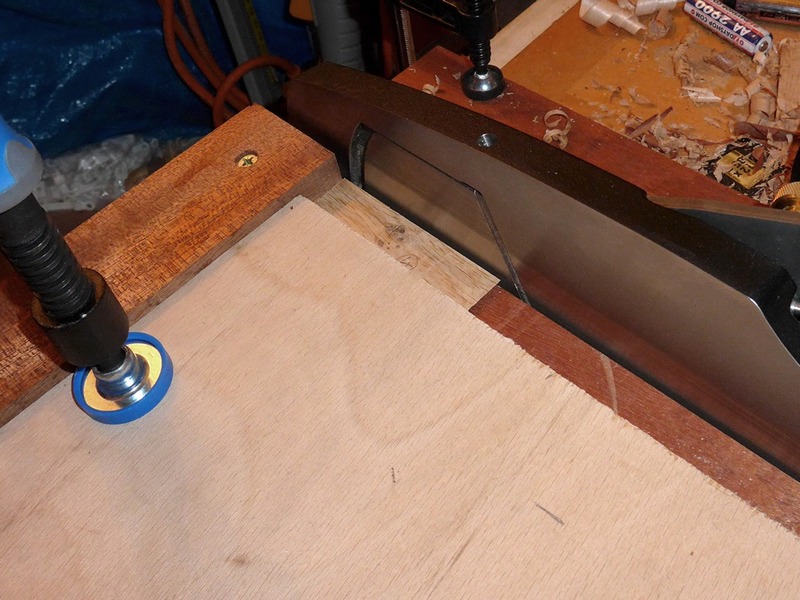 First I ripped and squared some 10mm Maple to use for the sides. 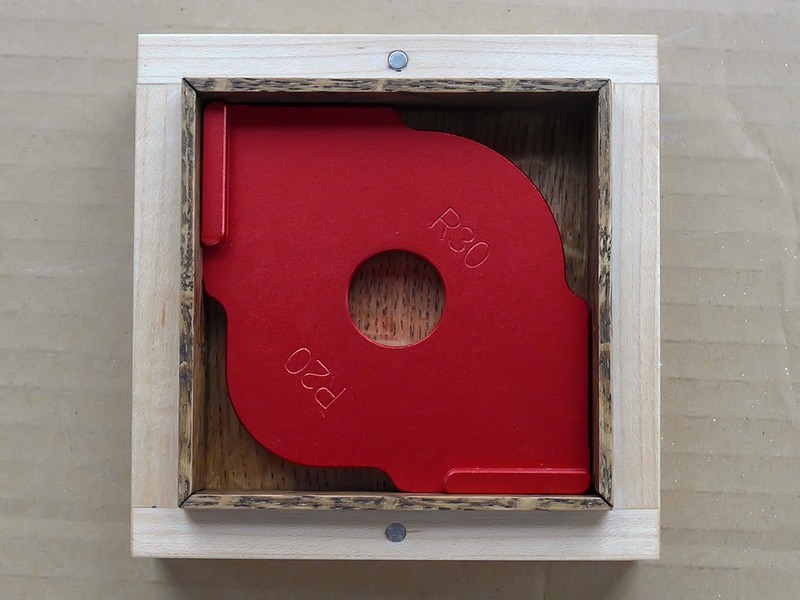 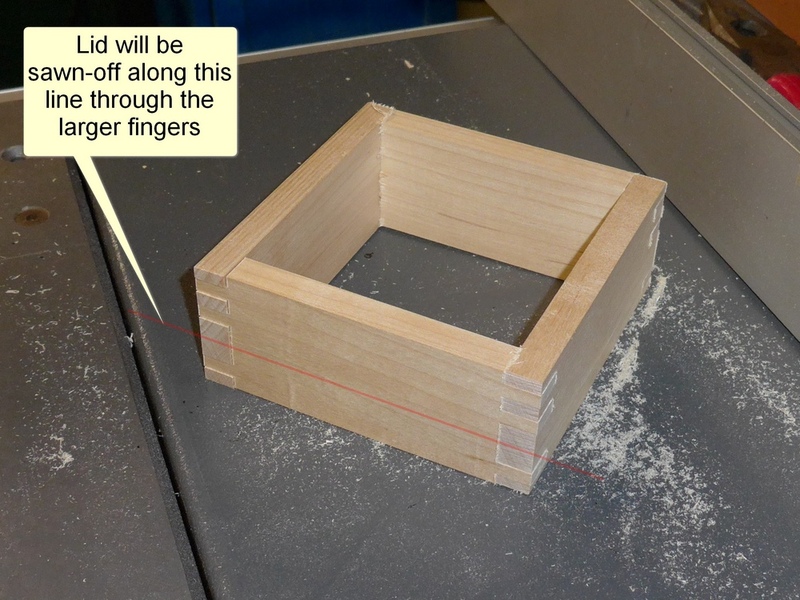 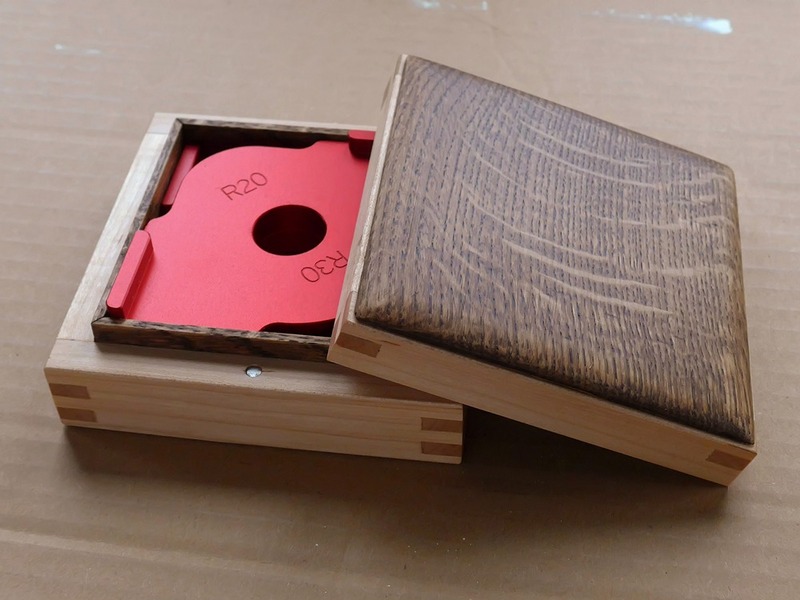 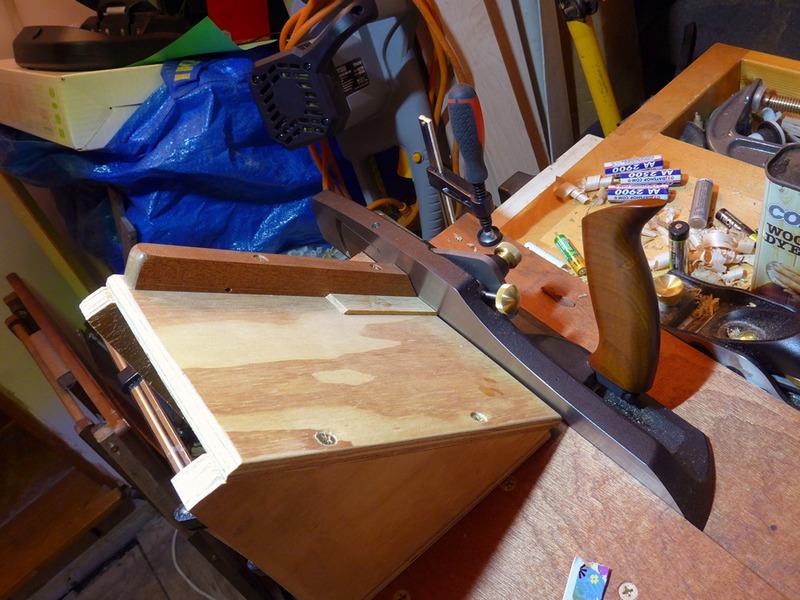 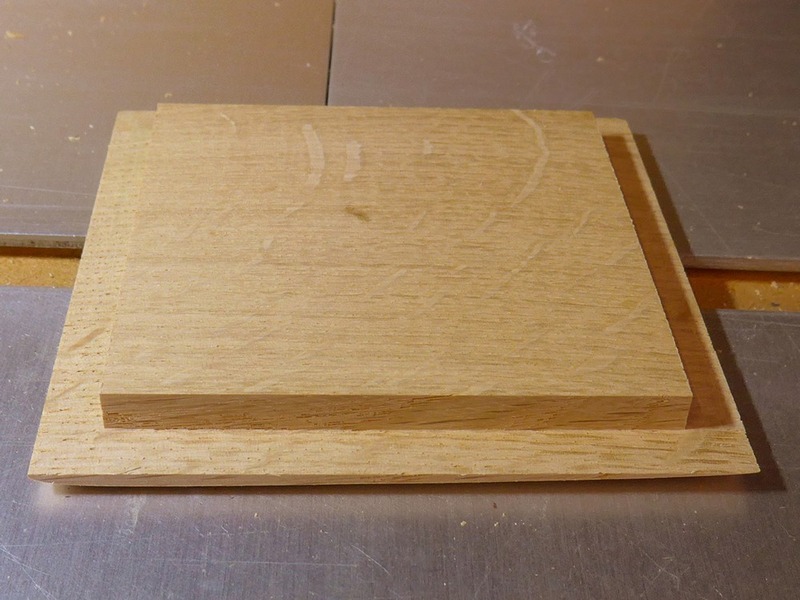 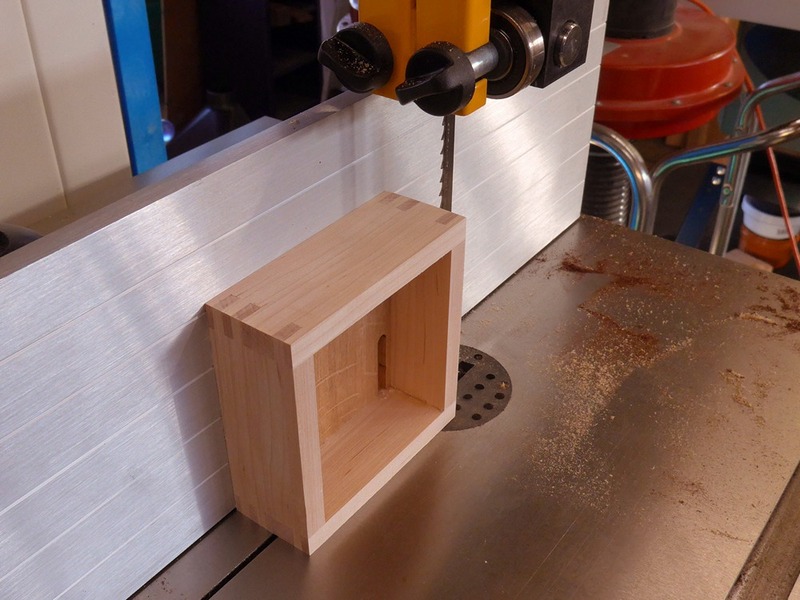 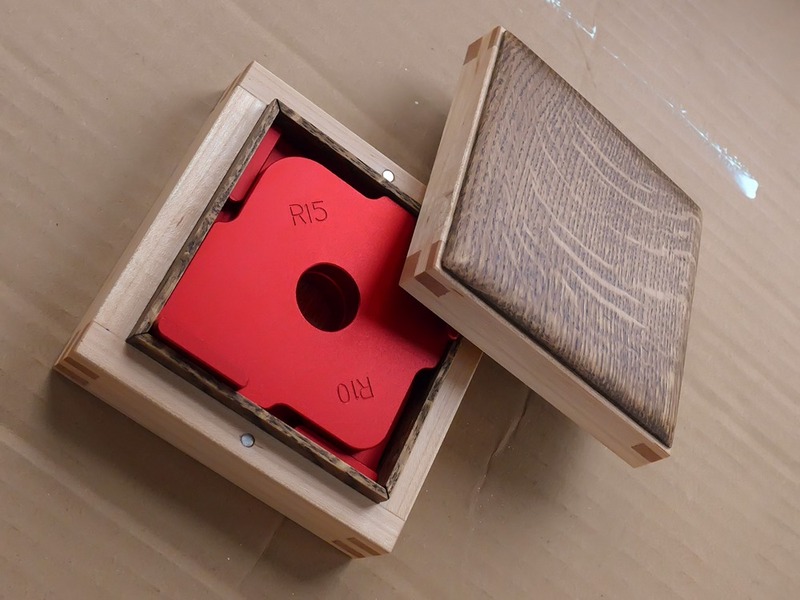 I decided to make a box using the sawn-off lid technique, so I arranged the box joint fingers leaving a larger finger where I could saw the lid off without getting too close to a joint line. 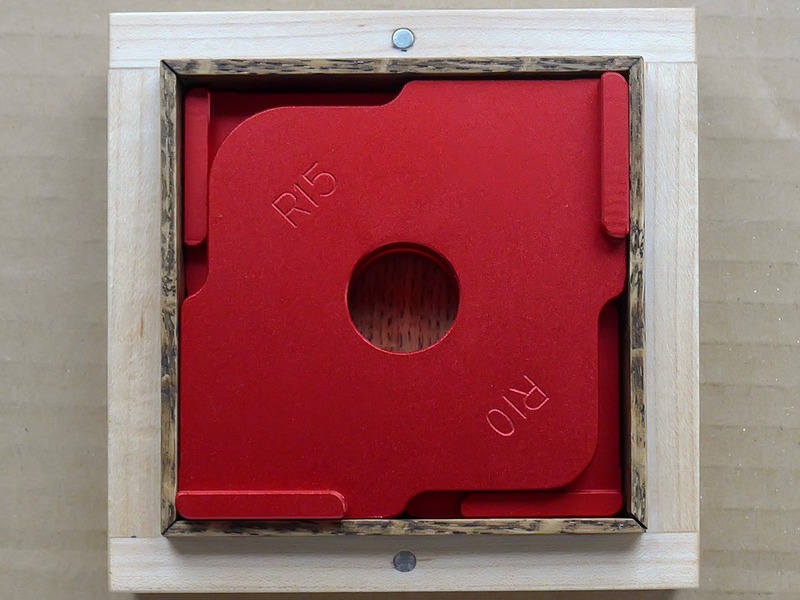 .. but when I came to plane it square on my shooting board, I found it almost impossible to work with. 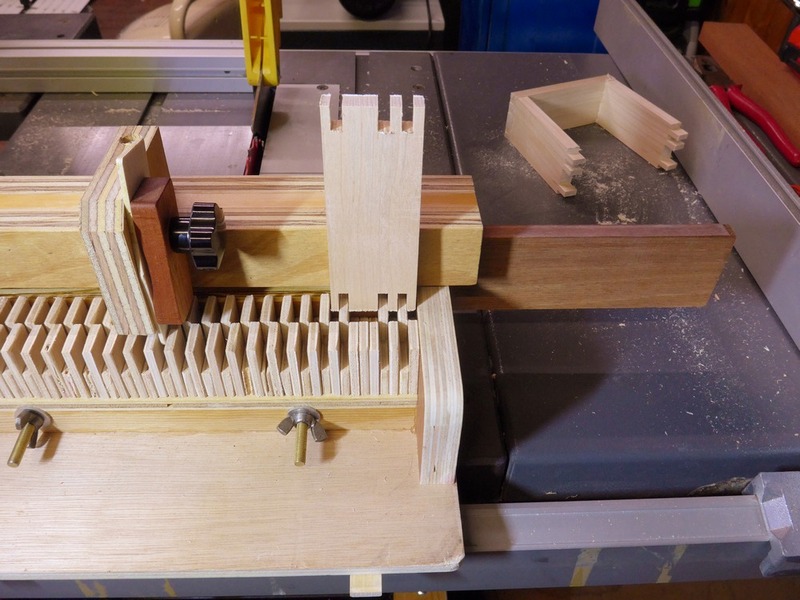 After much trial and subsequent internet research (which confirmed the difficulties I was having), I decided to give up! 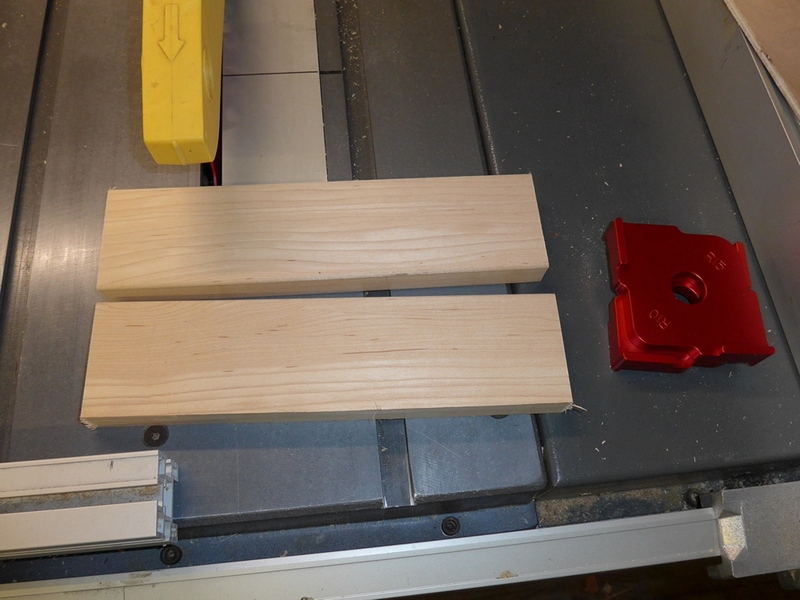 I found some quarter-sawn oak instead. 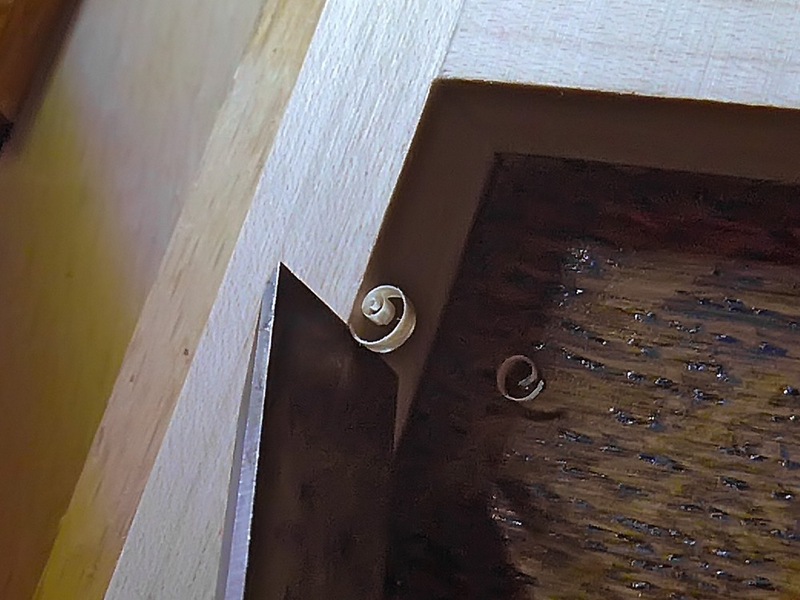 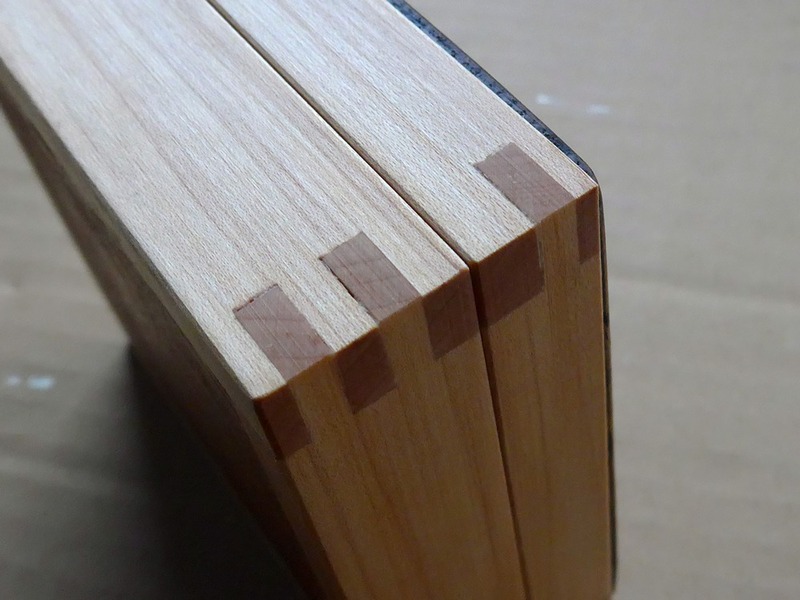 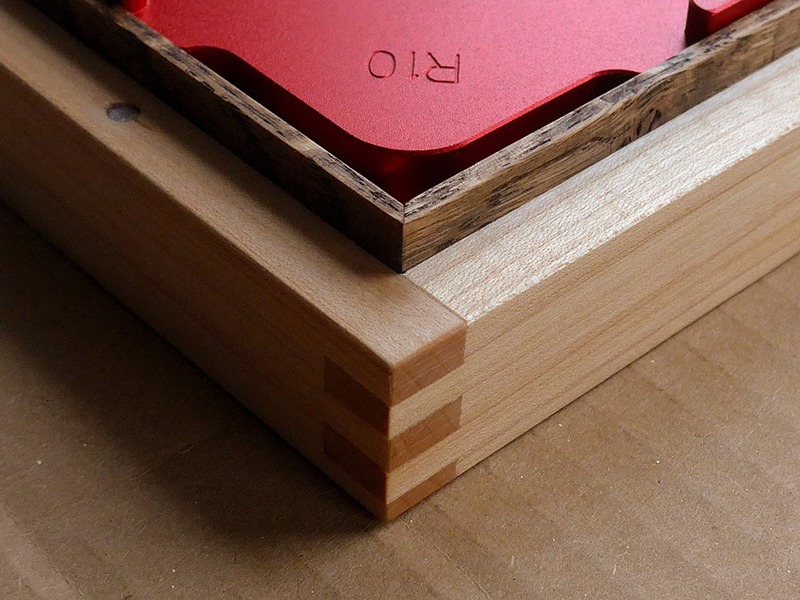 You shouldn’t normally glue a piece of solid wood in place as a box bottom because movement of the wood, due to varying humidity over time, would likely cause the glue to fail and the joint to pull apart. 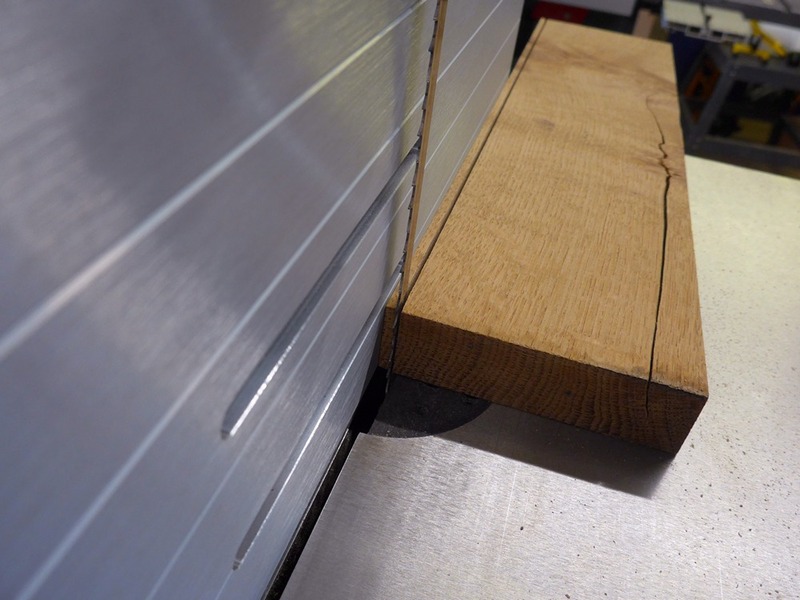 However, quarter-sawn timber is extremely stable across it’s width and would be unlikely to cause any problems on a piece of this size. 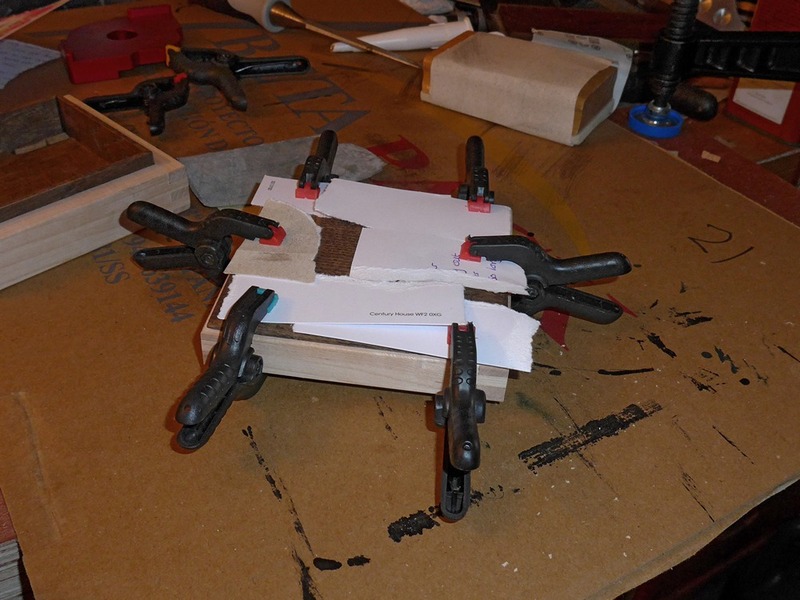 Next it was time to glue the sides and base together, after sanding the inside faces and giving the base a coat of sanding sealer. 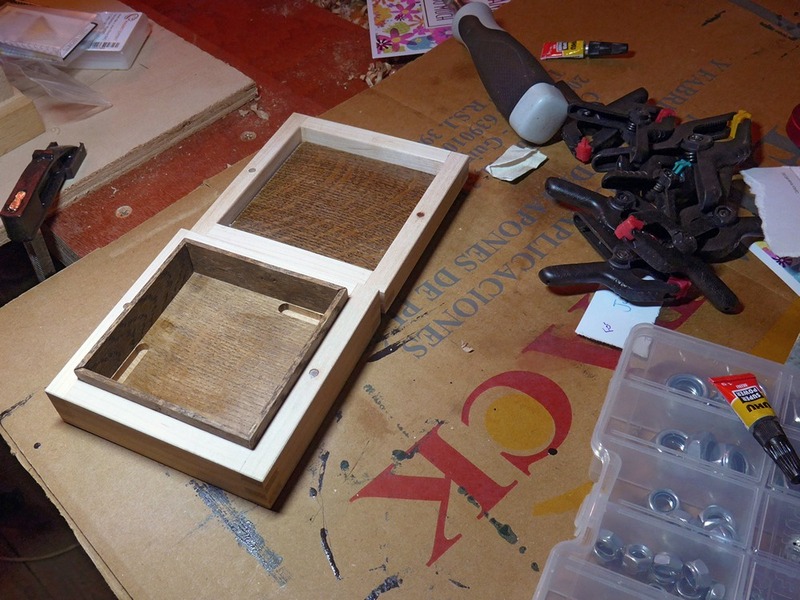 Glue squeeze-out was not really an issue on the outside (which would be planed and sanded), nor the inside (because it would be covered by the oak inserts to be fitted later. 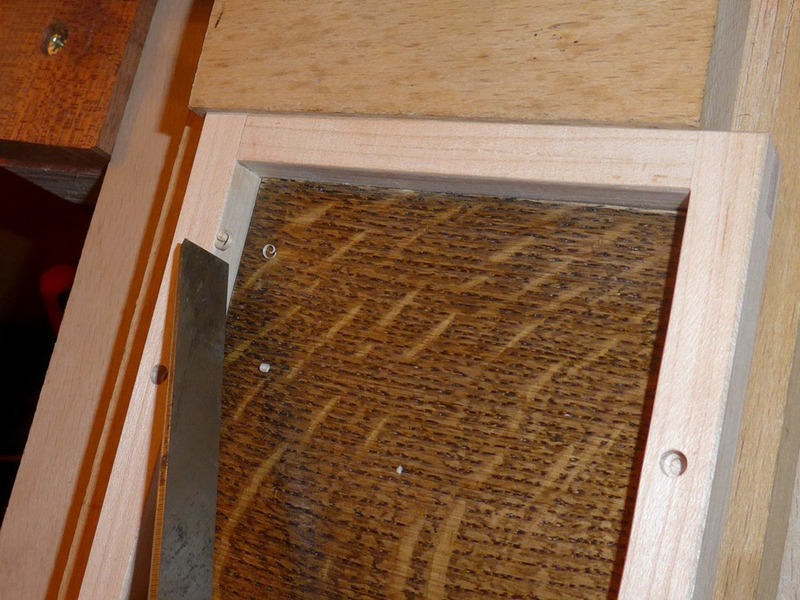 I cleaned the two parts with sandpaper. 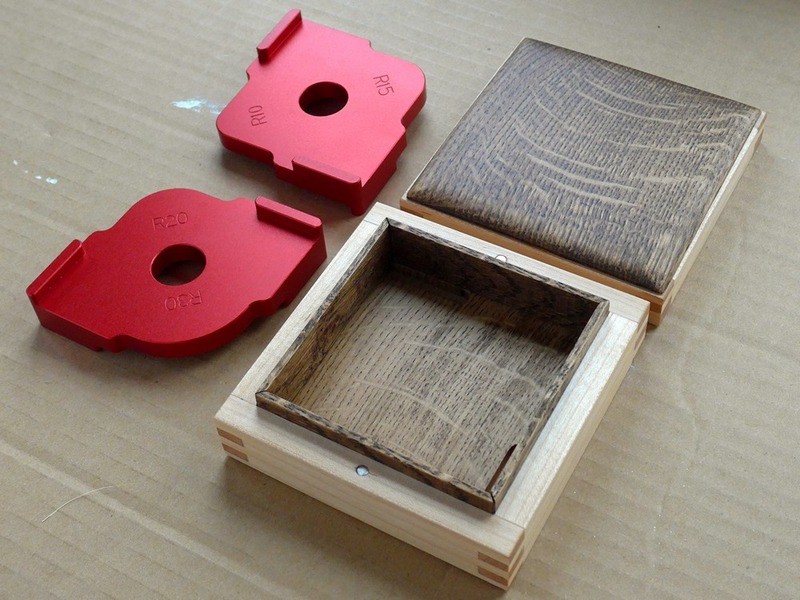 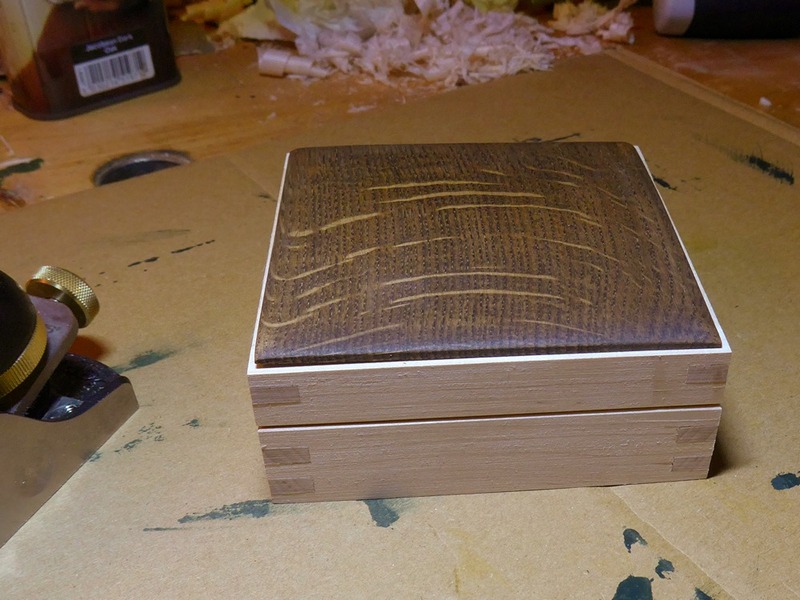 Then I stained the top part of the box. 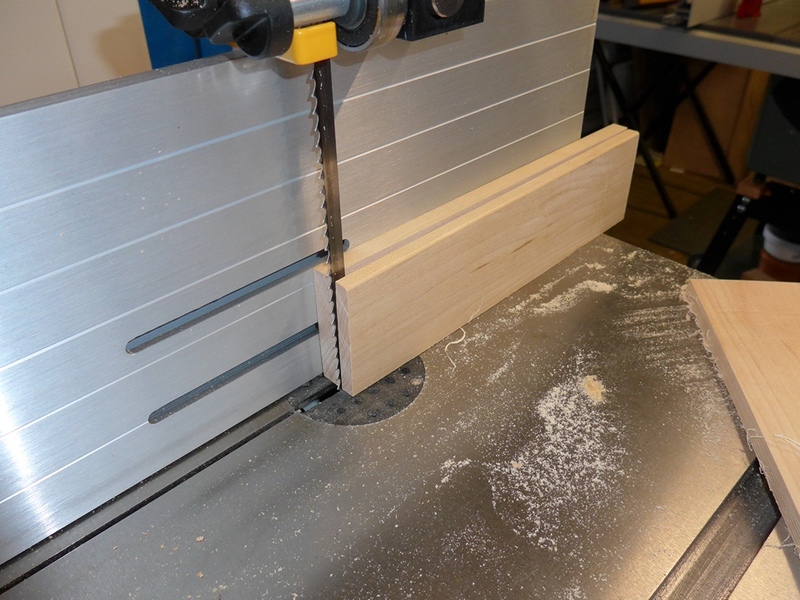 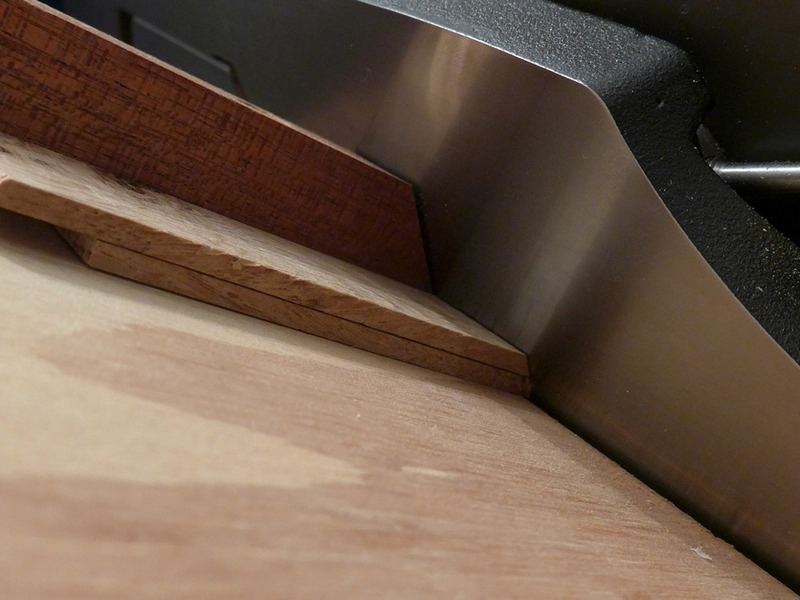 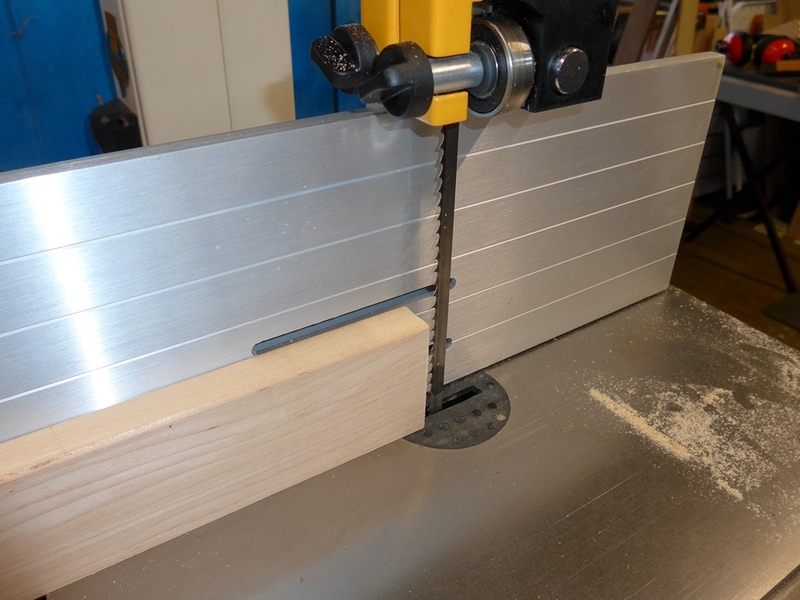 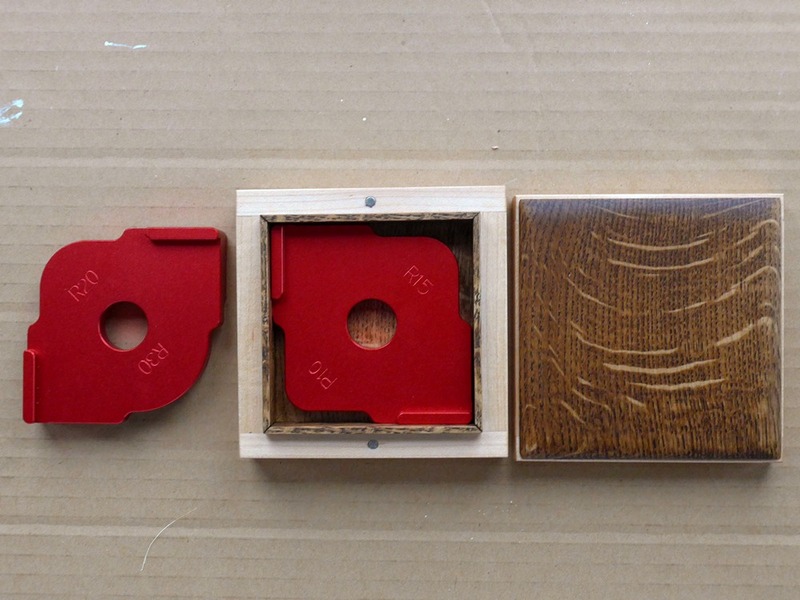 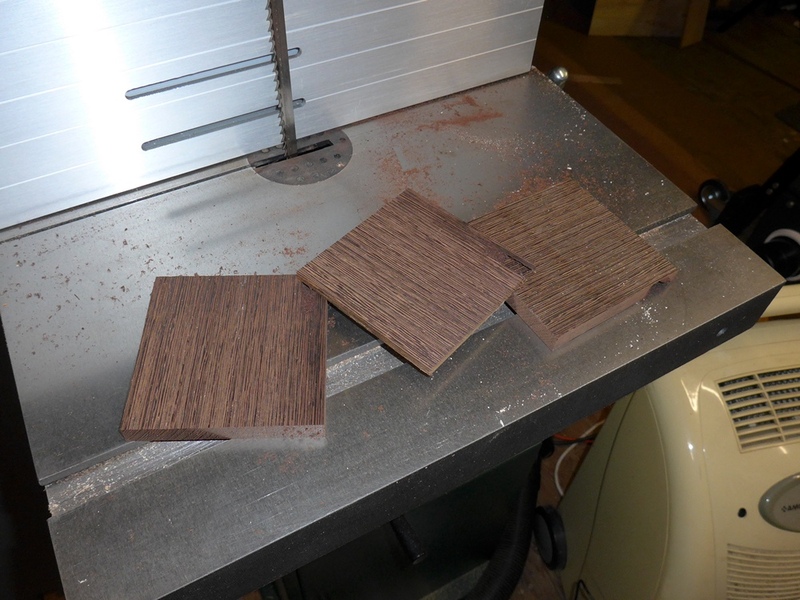 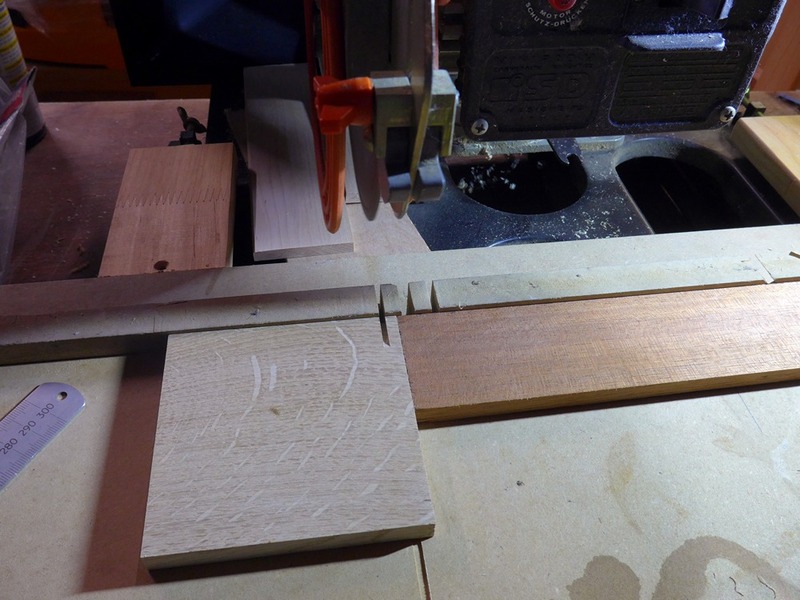 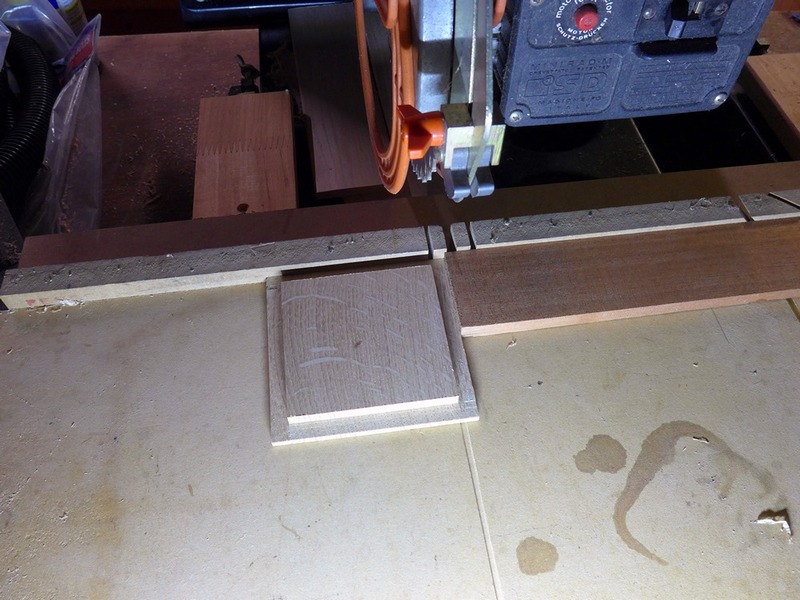 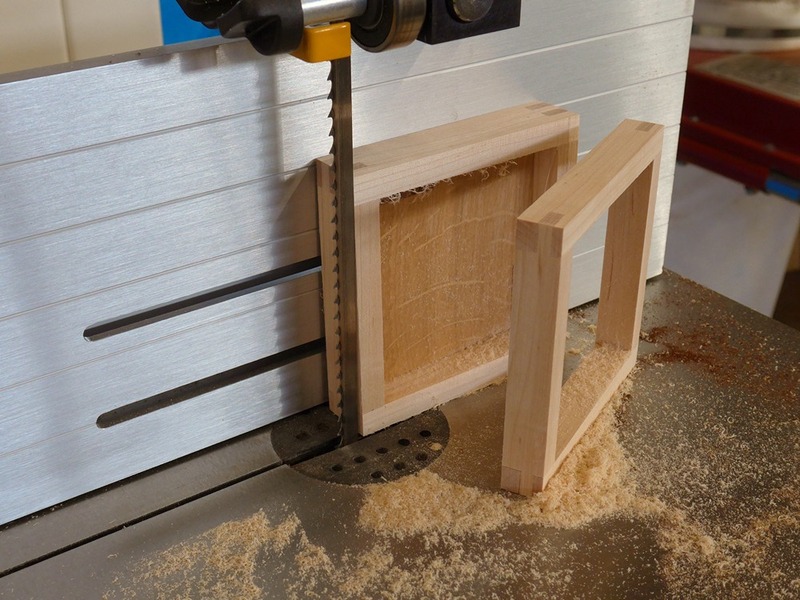 Then I used the bandsaw to cut some thin (approx 2.5mm) strips of oak to be used for the inserts. 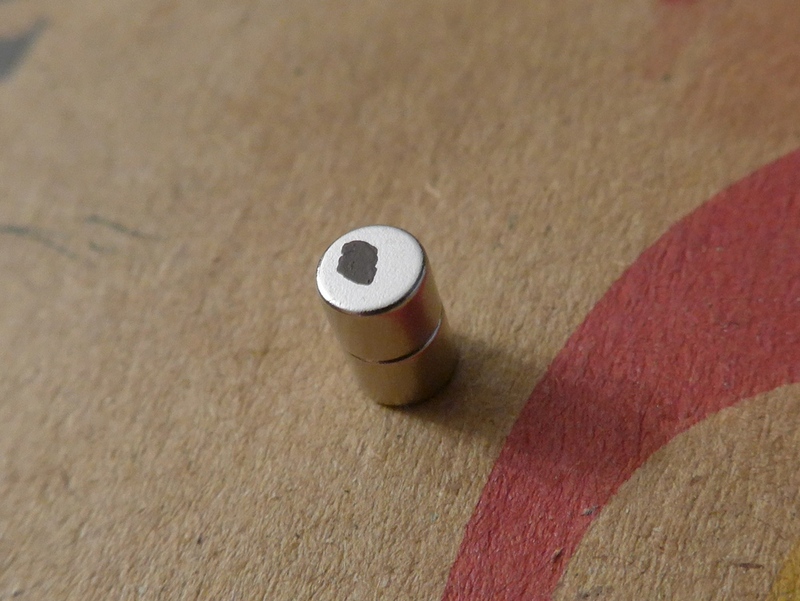 Then I super-glued the magnets into their holes after marking the poles with permanent marker to ensure correct polarity. 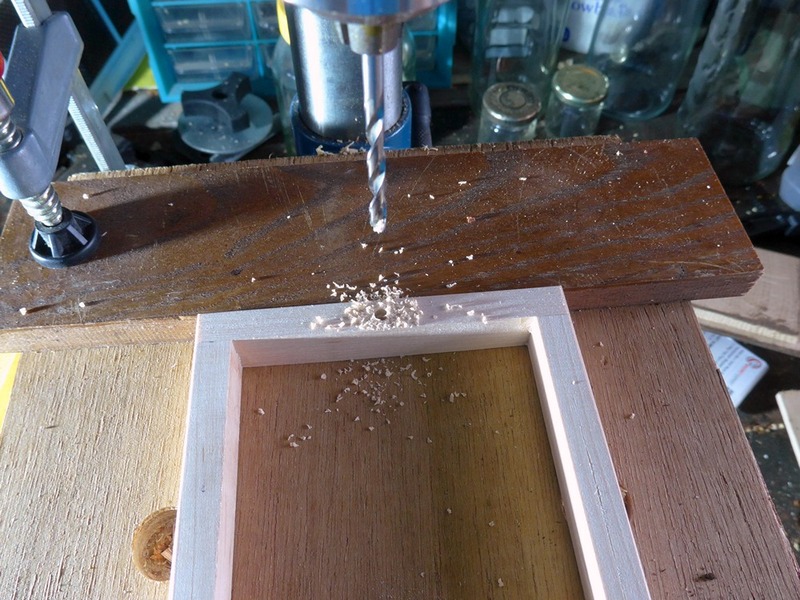 I arranged the poles such that the lid would only fit one way (the magnets would repel if the lid was the wrong way round). 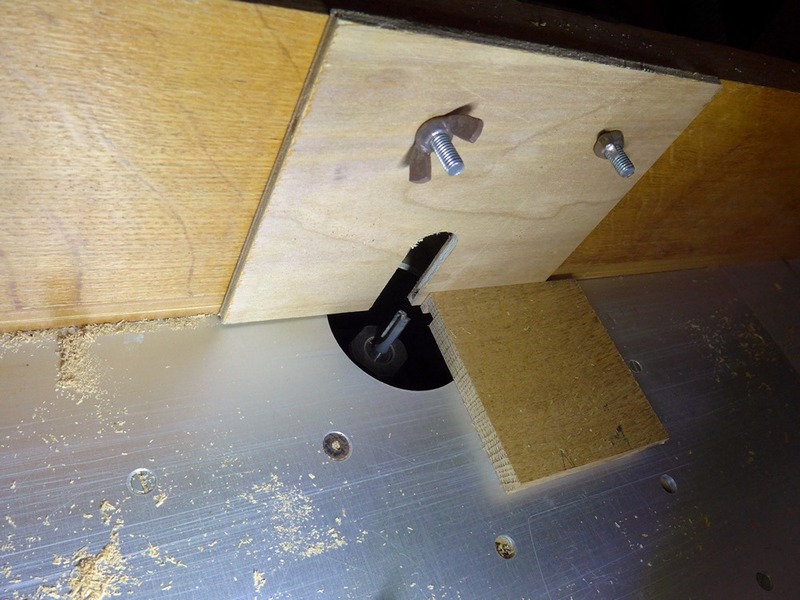 There was a moment of panic when I pushed one magnet part way into the hole but couldn’t seat it fully because the glue had grabbed. 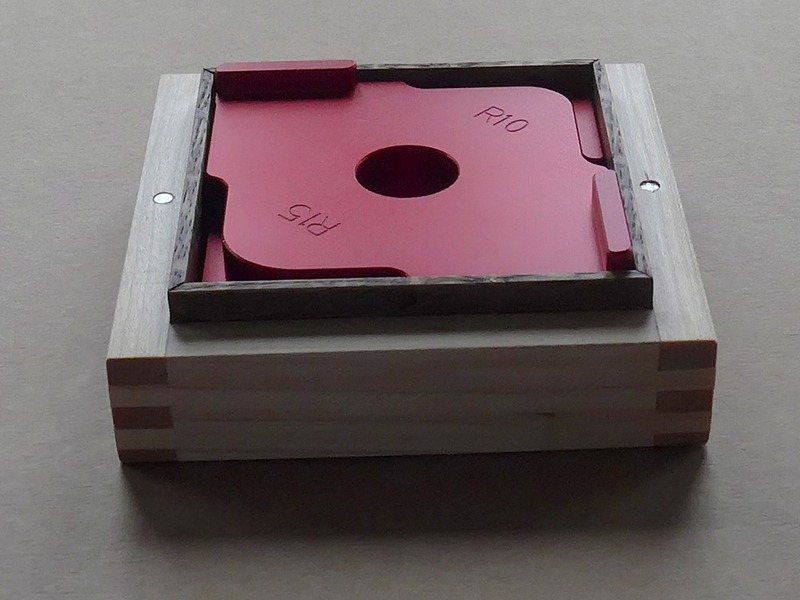 I frantically looked round for something to push it in with before the glue set. 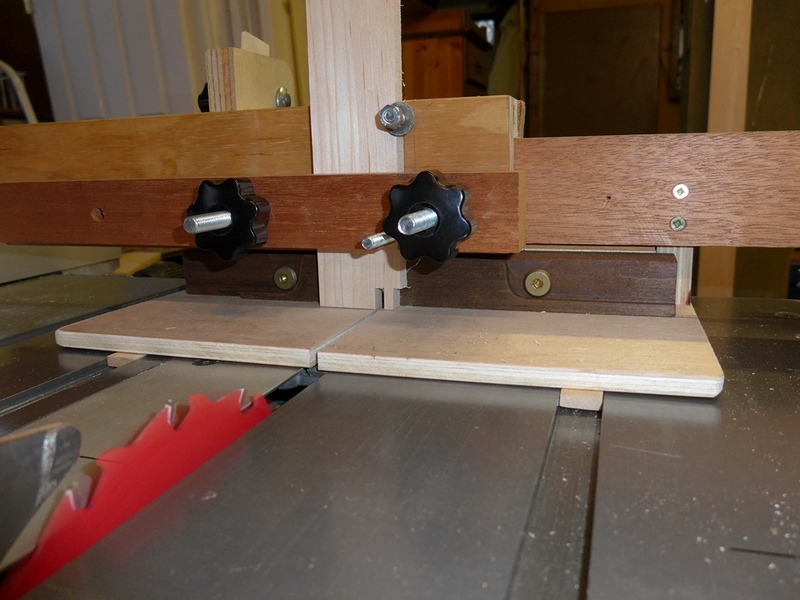 All I found to use was a screwdriver, and in my haste I pushed the magnet down slightly too far and dented the wood. 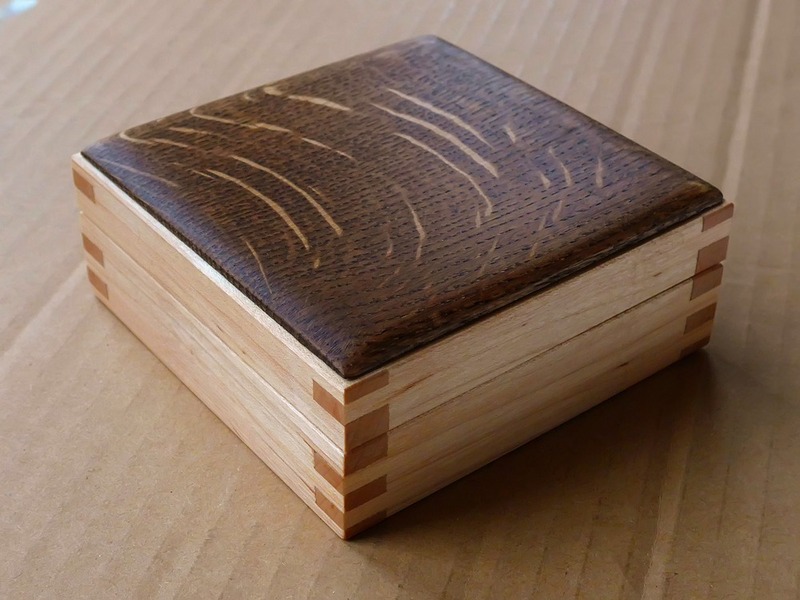 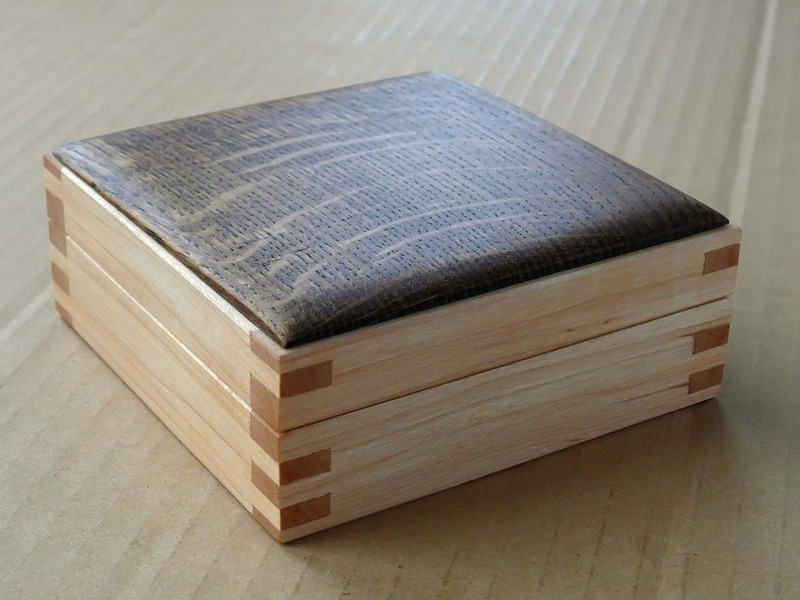 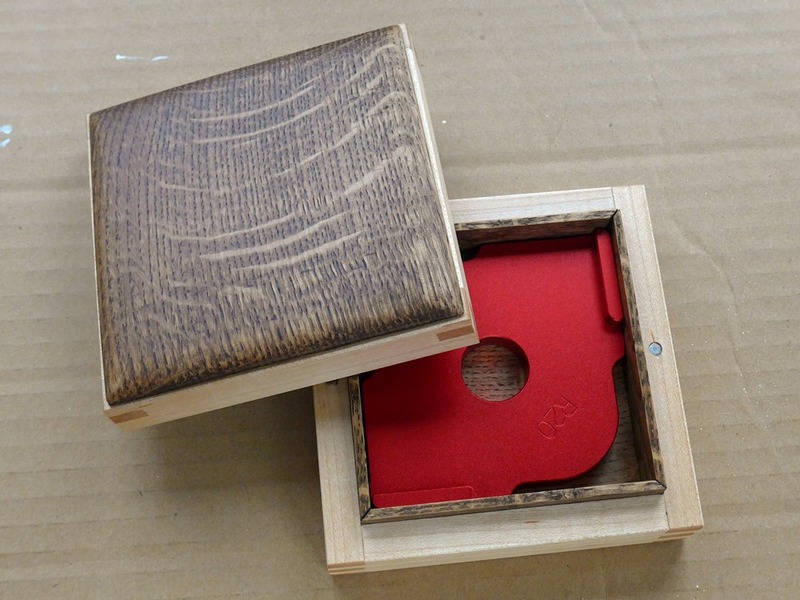 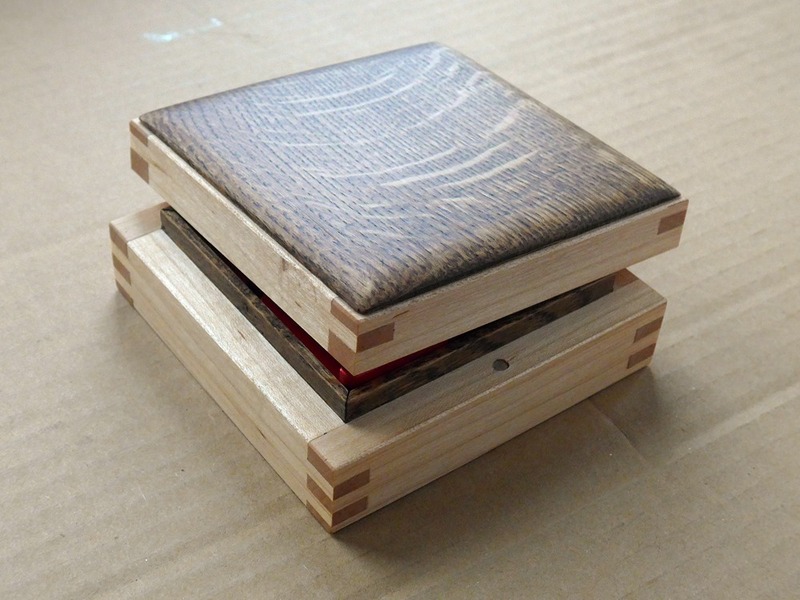 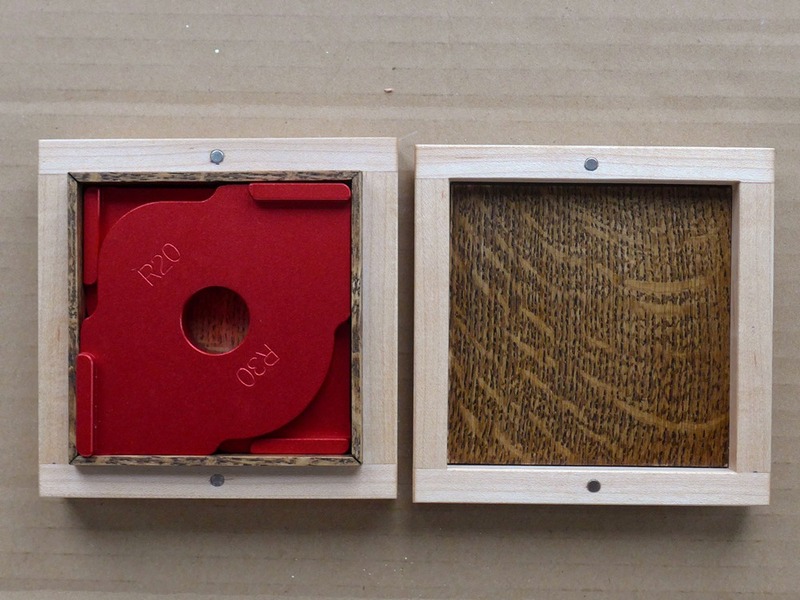 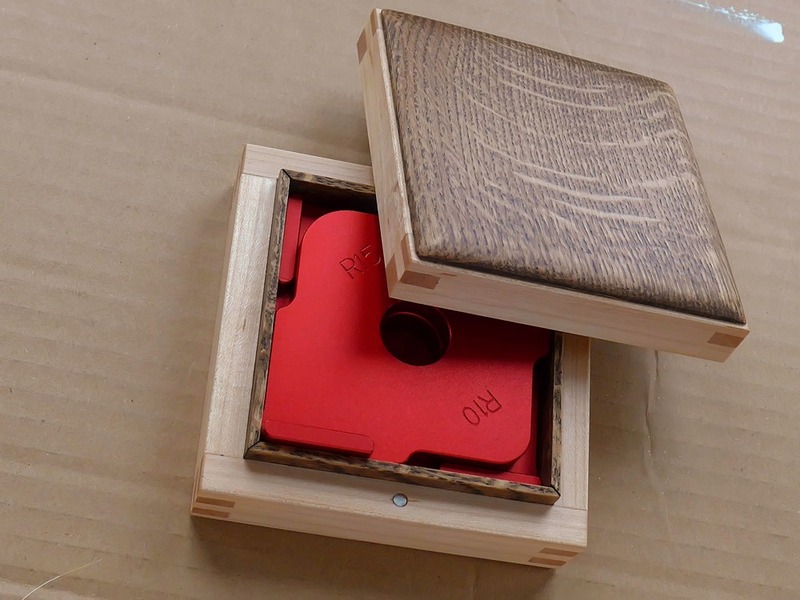 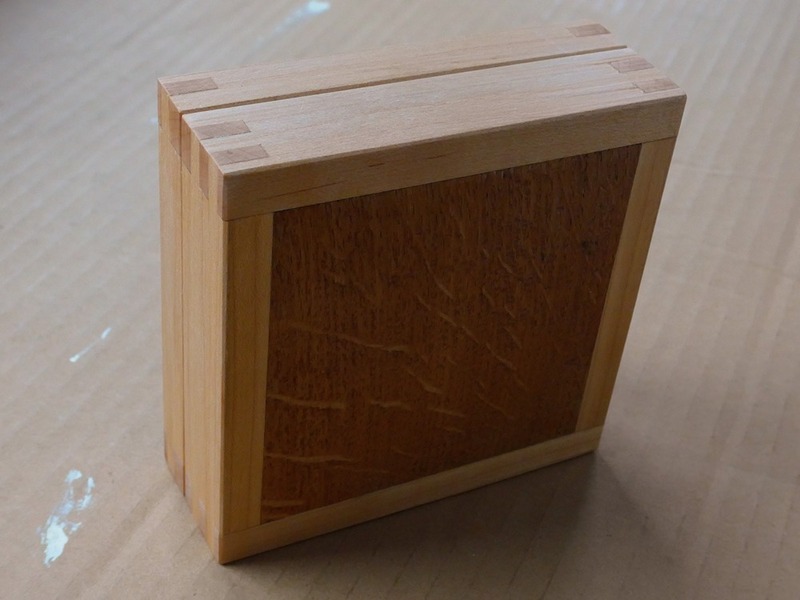 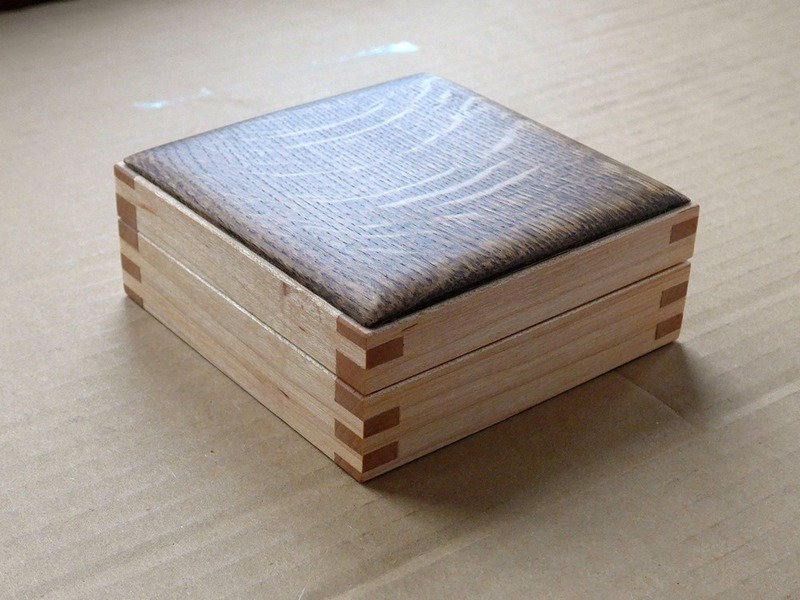 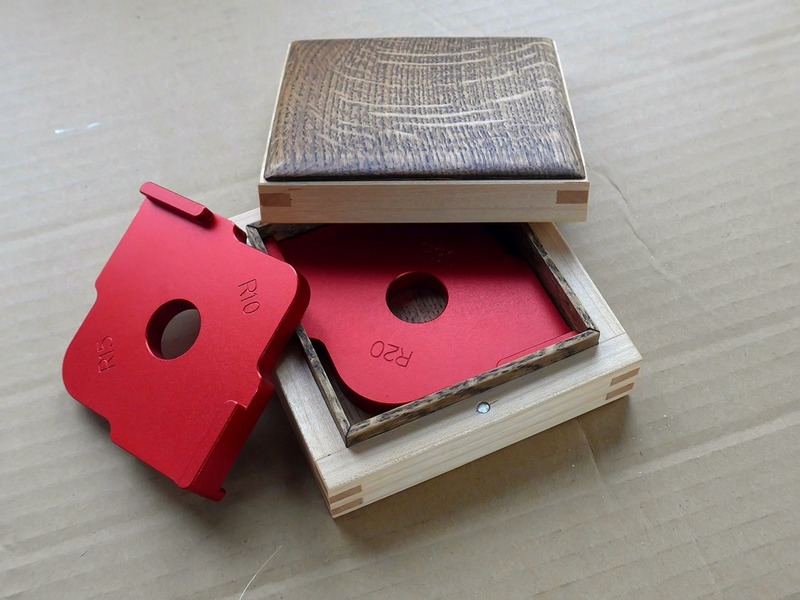 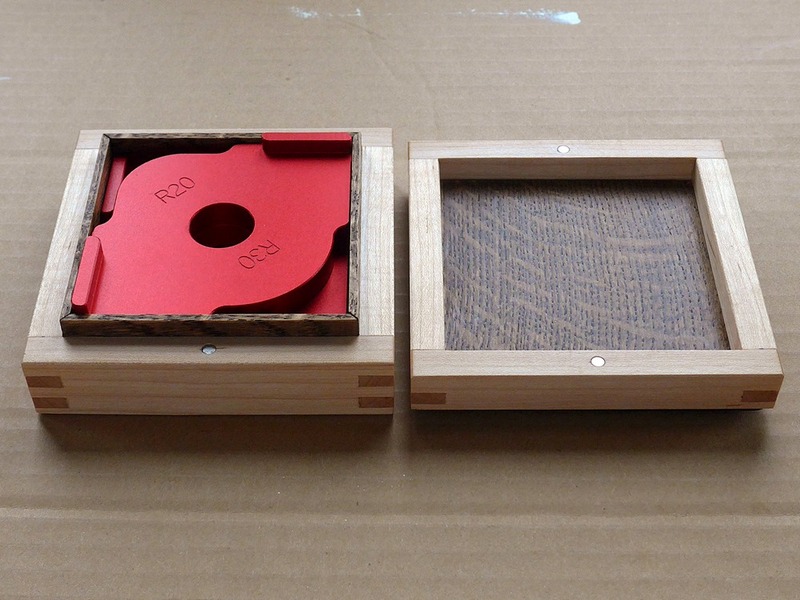 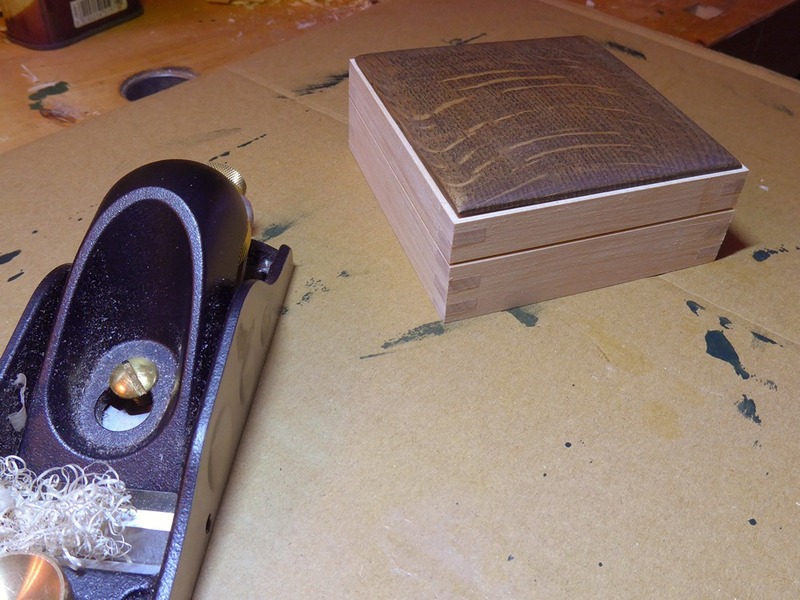 After a light sanding all over, I finished the box using a wax oil treatment. 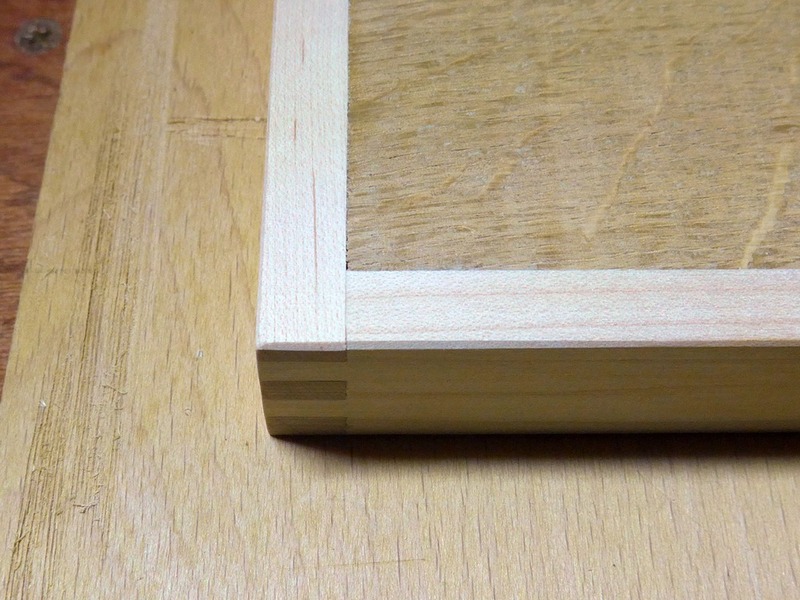 As I wiped the finish on I noticed it was lifting some of the stain I’d used on the lid. 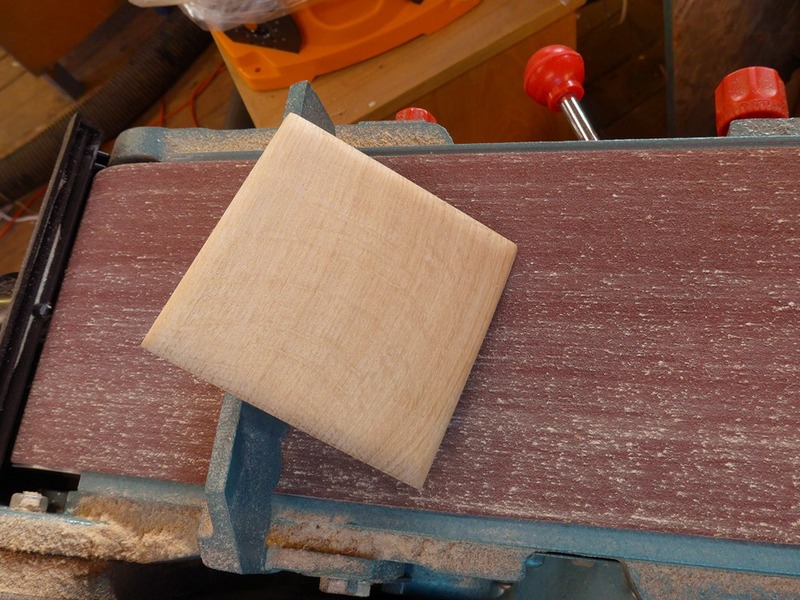 This was disconcerting and I had to be very careful to not let the now-stained cloth touch any of the very light maple. 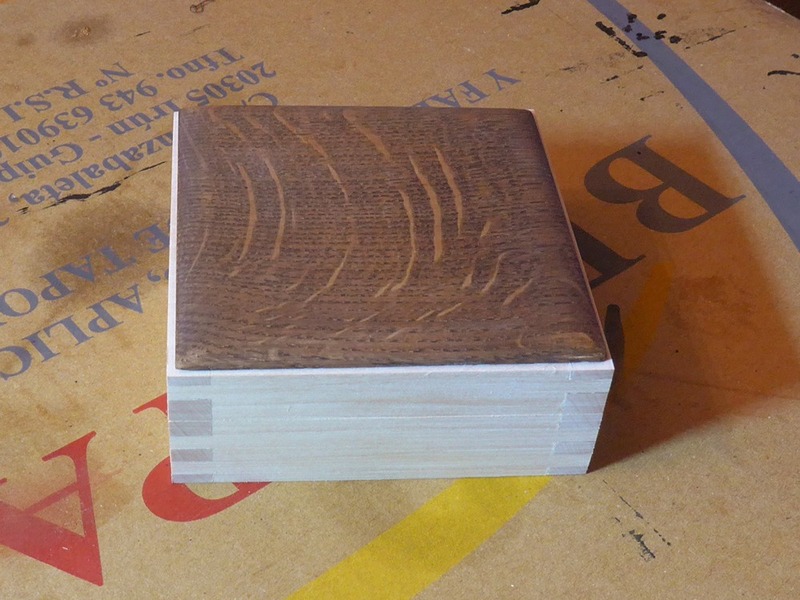 I have never had this happen before in all the hundreds of times I’ve applied finish. 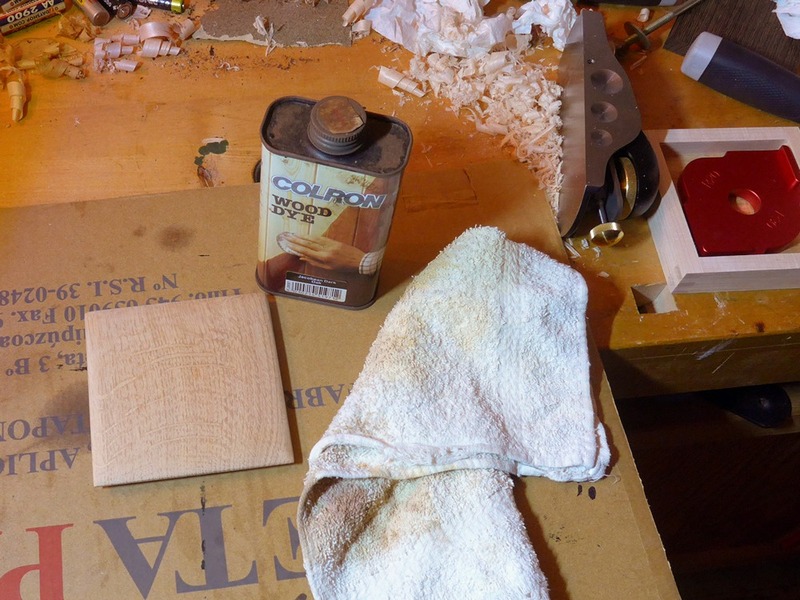 Maybe I’ve never used a wipe-on finish with stain before? 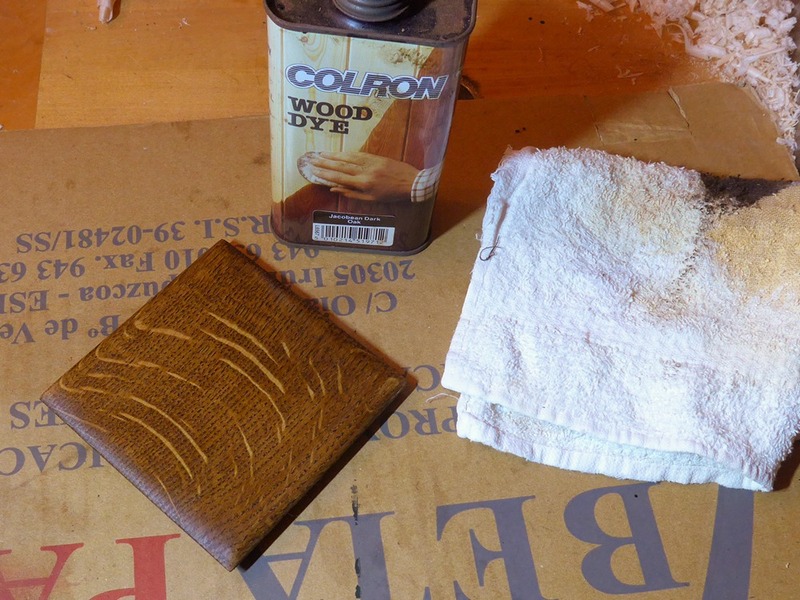 Or maybe I hadn’t given the stain time enough to dry (although I’m sure I’d left it for a couple of days). 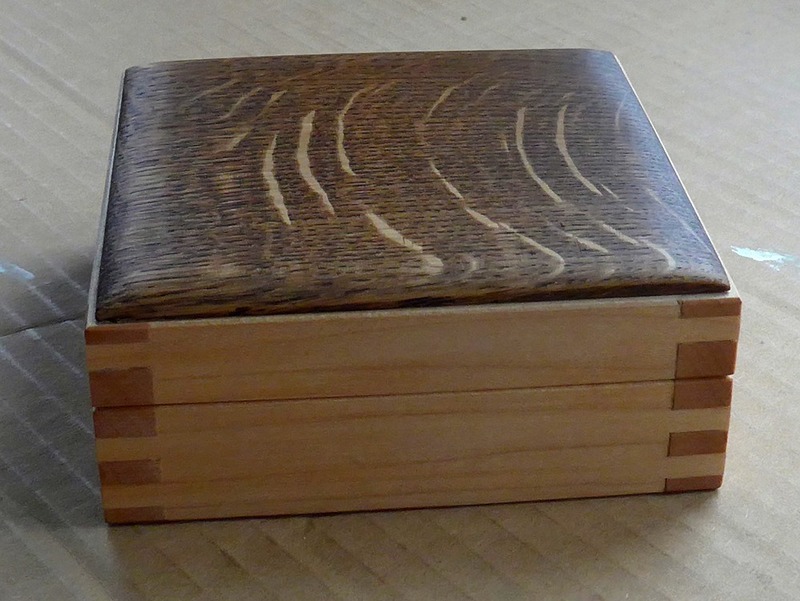 I’m pleased with the result and particularly like the cushion-shaped lid. 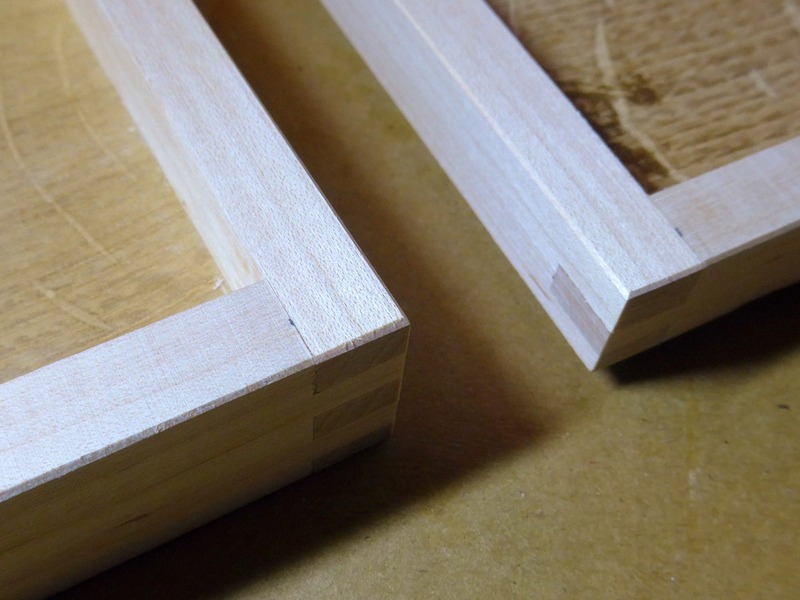 The templates fit perfectly with less than a millimetre clearance around them. 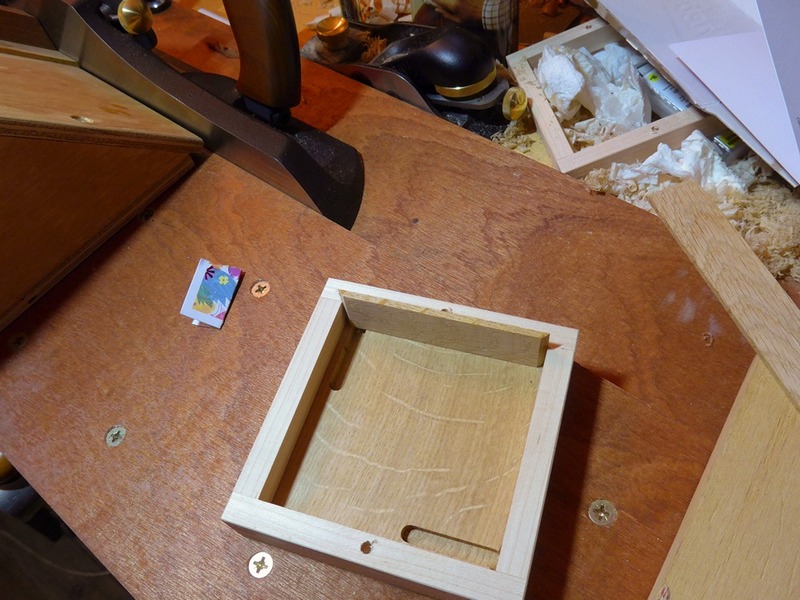 Orientated the magnets such that the lid only fits one way. 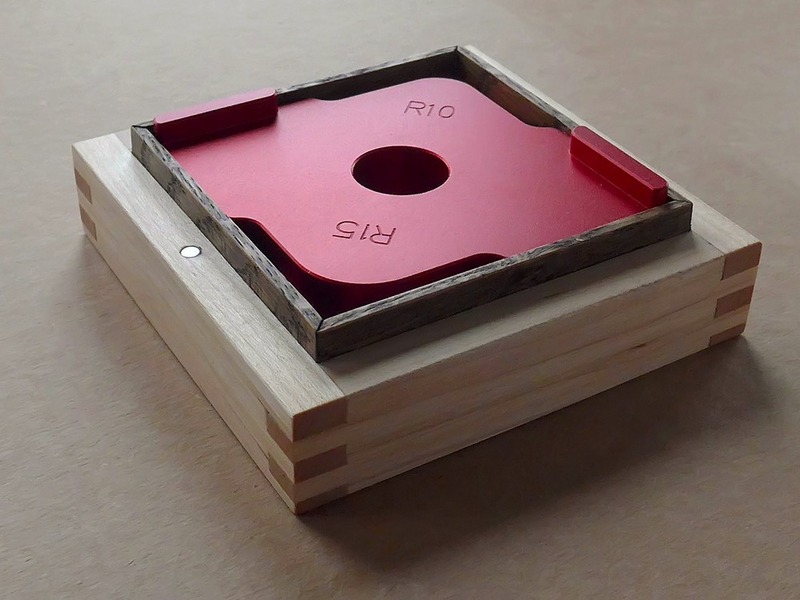 If you try to fit it the wrong way the magnets repel. 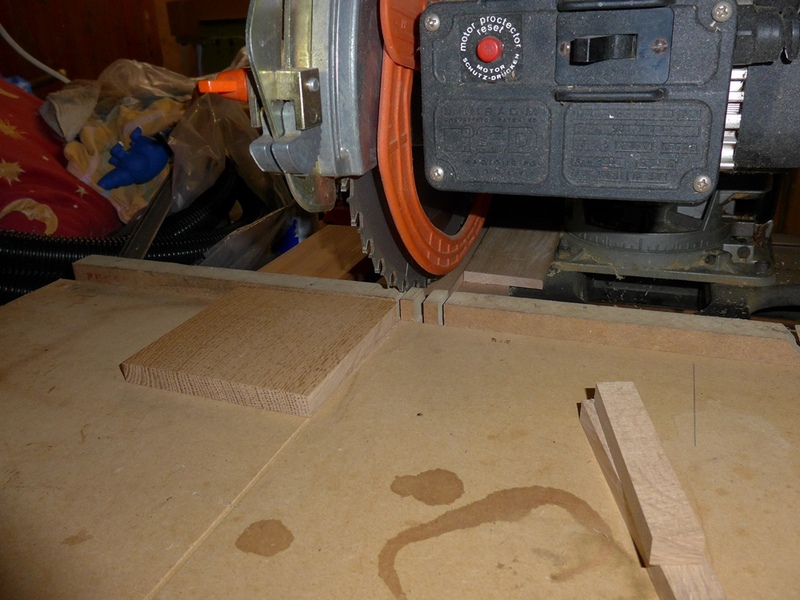 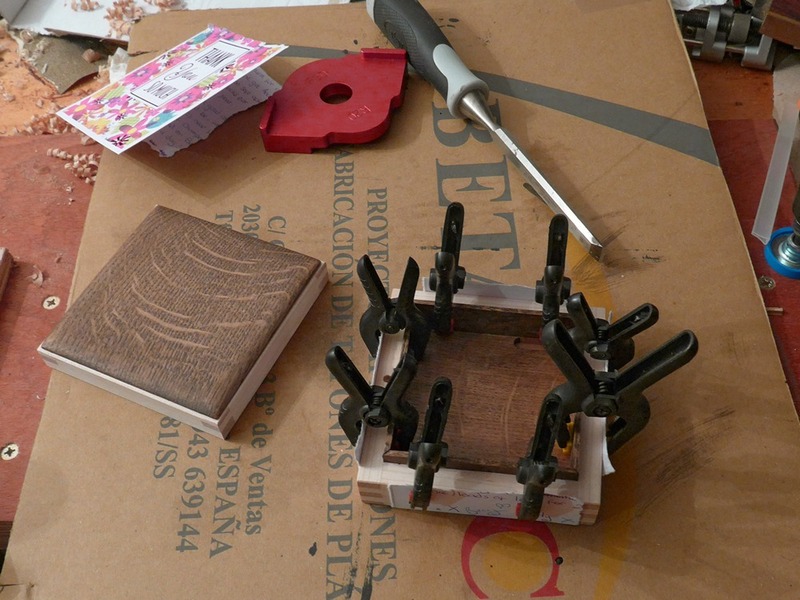 Panicked when magnet wouldn’t go in smoothly – used screwdriver and accidentally marred wood. 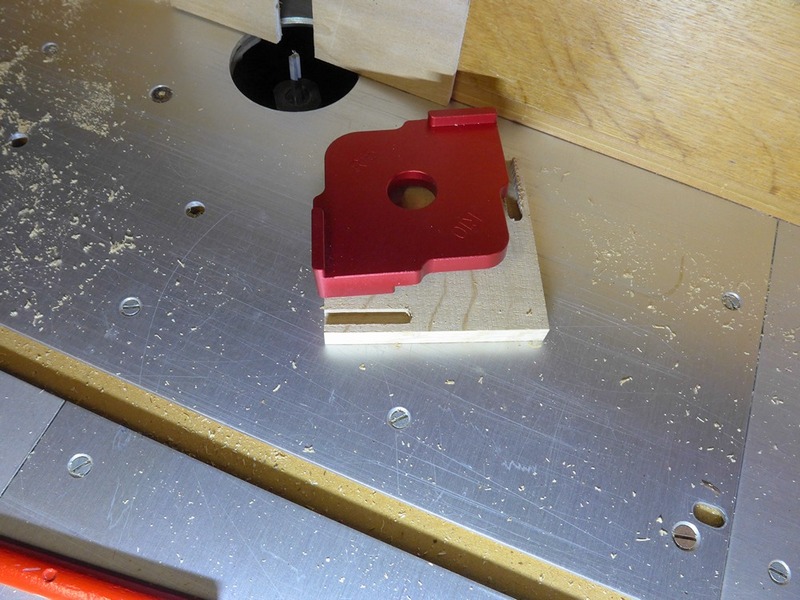 Should have had a small piece of wood to use to push the magnet down flush. 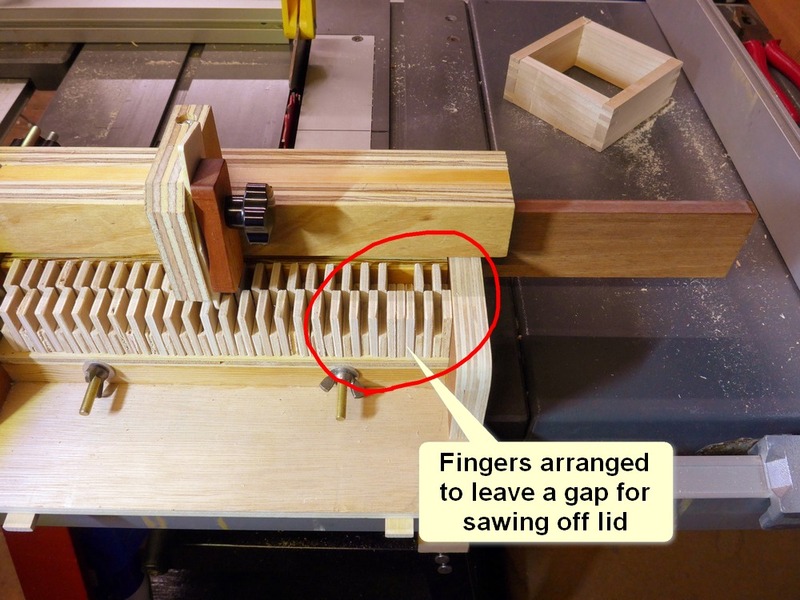 Cutting the lid off through the larger finger didn’t produce the even distribution of fingers I was hoping for. 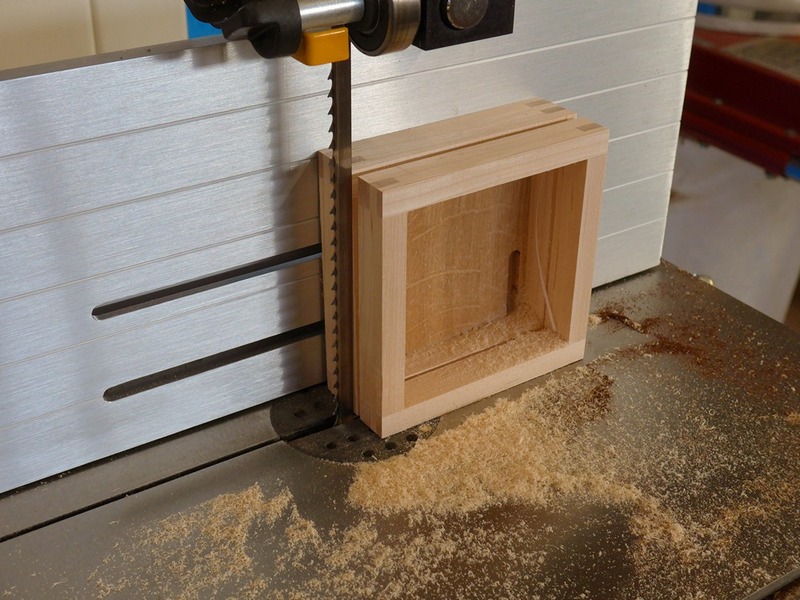 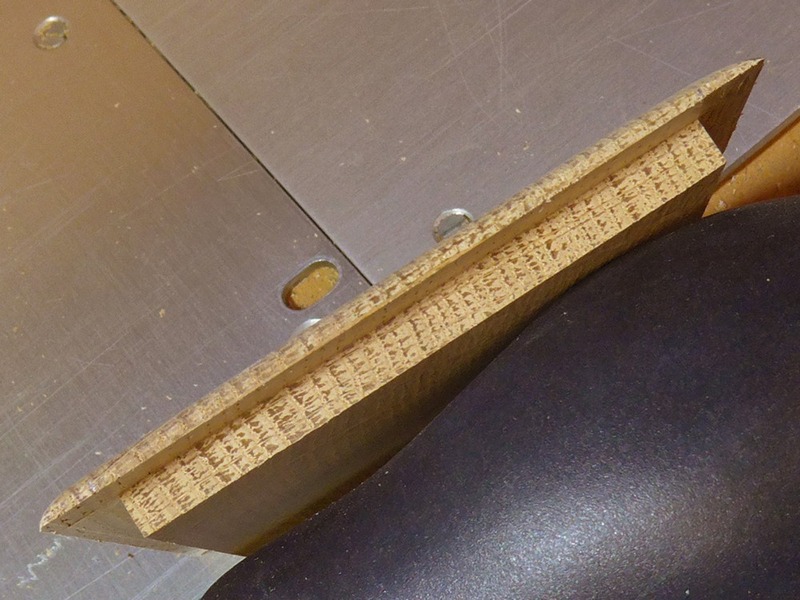 The kerf of the bandsaw wasn’t thick enough to give the effect I was after. 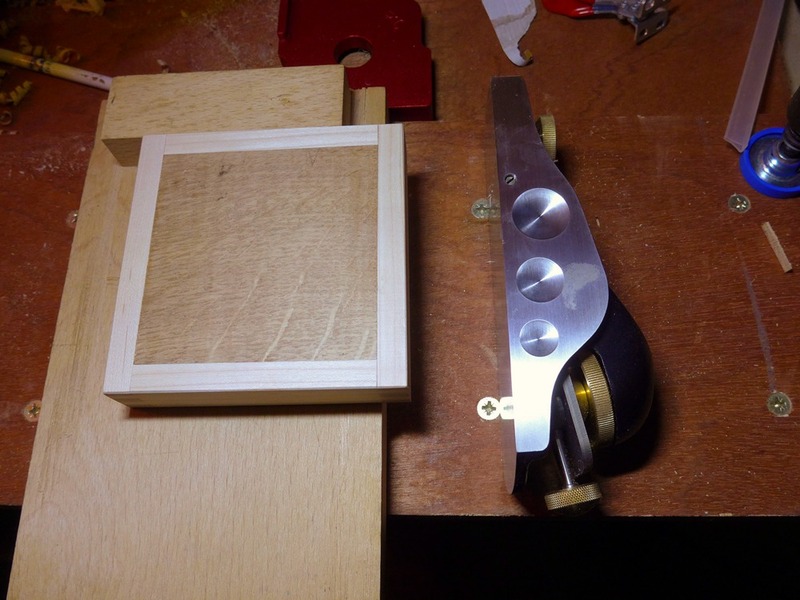 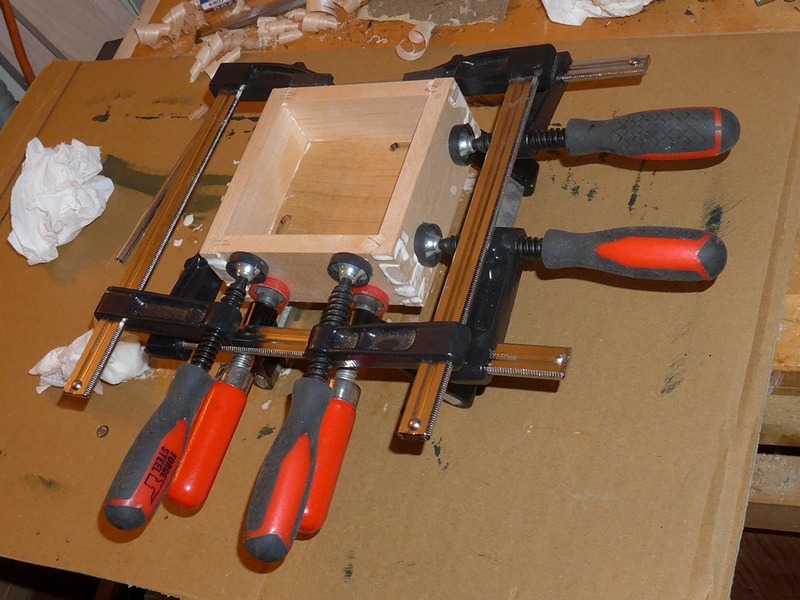 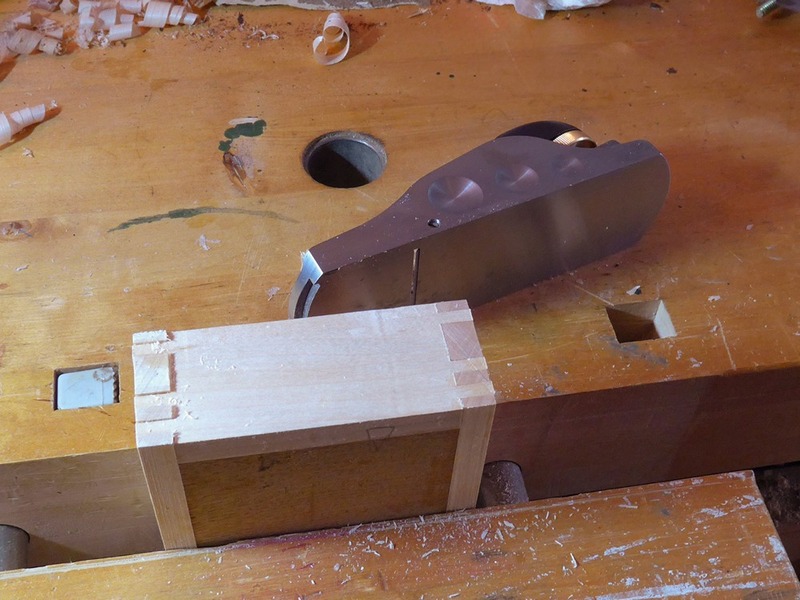 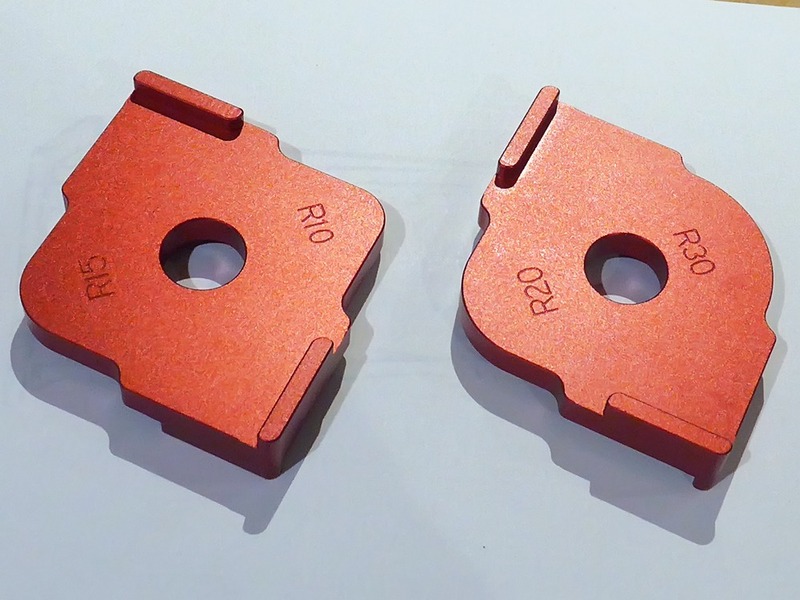 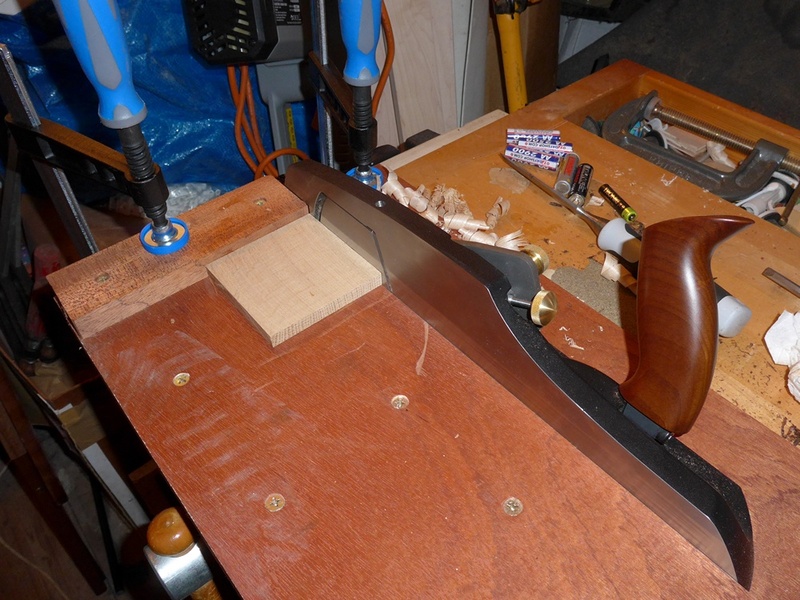 I should have used a thinner shim on the box-joint jig to reduce the size of the larger finger.